September 2012 – Concurrent Technologies announces their latest 3U OpenVPX™ processor board featuring the 3rd generation Intel® Core™ processor. The TR 90x/x1x combines the high performance and power-efficiency of the 3rd generation Intel® Core™ processor with optional board level security features to deliver a high performance, security enabled processing solution to the OpenVPX™ market. Initially available as a commercial grade product, ruggedized variants will be released in the near future. 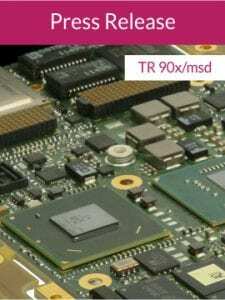 The highly integrated TR 90x/x1x single board computer features dual-core or quad-core 3rd generation Intel® Core™ i7 processors and Mobile Intel® QM77 Express chipset with up to 16 Gbytes of ECC DRAM. The TR 90x/x1x is a VITA 65 compliant, plug-compatible upgrade for earlier generation products. Users of the TR 90x/x1x could benefit from an increase of up to 15% in CPU performance and an increase of up to 50% in graphics performance while operating within the same power budget when compared to the previous generation of Intel® Core™ processor-based 3U VPX™ products. In addition to the power and performance benefits, the TR 90x/x1x also features USB 3.0 capability to enhance IO performance and is offered with optional security features. The security package offered with the TR 90x/x1x provides a comprehensive set of hardware, firmware and software features designed to aid customers to deliver secure embedded solutions into applications where protecting critical technologies and data is mandatory. It provides a set of customer configurable security options that can be tailored to provide a unique security solution for each specific application. The TR 90x/x1x provides a configurable PCI Express® fabric interface supporting 1 x8, 2 x4, 1 x4 + 1 x4 at Gen 1 or Gen 2 data rates. 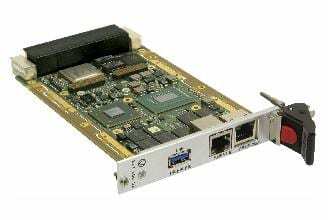 Comprehensive rear IO includes dual Gigabit Ethernet or dual 1000Base-BX channels, dual SATA600 ports, a serial RS232/422/485 port, dual USB 2.0 ports and a VGA port. Optional front IO includes a serial RS232 port, a Gigabit Ethernet port and a USB 3.0 port. A single XMC slot is also available to further increase the I/O capability of the board through the introduction of XMC modules from Concurrent Technologies’ range of products or third party boards. An on-board SATA Flash drive provides storage. Applications for the TR 90x/x1x are expected in real-time, military embedded, aerospace and transportation systems for data acquisition, control systems and video signal processing. For ease of integration, many of today’s leading operating systems are supported including Linux®, Windows® 7, Windows® XP, Windows® Embedded Standard 7, QNX® and VxWorks®. The TR 90x/x1x is also supported by Concurrent Technologies’ Fabric Interconnect Networking Software (FIN-S) which provides a high performance, low latency, communications mechanism for multiple host boards to intercommunicate across high speed serial fabrics like PCI Express® (PCIe).